This is not our first rodeo with Burson Audio. If they even have rodeos in Melbourne, Australia, where Burson Audio is based. We looked at the HA160 headphone amp in Issue 79, and the original Conductor – complete with matching Timekeeper amps in Issue 105. Of these products, the Conductor was perhaps the most impressive in performance terms, so when the time came to look at it’s latest guise – the tricked-out, Conductor Virtuoso 2+ (‘V2+’) – we jumped at the chance. It more than lived up to expectations, too! The Conductor V2+ is no simple step-change. It’s a root-and-branch rebuild of the concept from scratch. The basics remain unchanged – a silver box with two analogue single-ended, and three digital connections (coaxial, optical, USB). There’s a good, clicky volume pot behind the front panel and a blue LED volume readout, which is a pig to read unless you are staring right in front of the Conductor V2+. There’s a palpable sense of solidity to the build. It’s... stocky, not in the modern euphemism meaning ‘fat’, but in the old, original meaning, the kind that everyone in The Godfather(except possibly Al Pacino) did so well. The square thick top panel, held together with large Allen bolts gives it a powerful, commanding weight that bespeaks of quality. Quality extends deeper than just the case. The entire circuit has been redesigned, and is now based on Burson’s V6 SS op-amp, which Burson thinks is the best sounding audio op-amp in the world. In fairness, if you get to designing your own op-amps, you get to be proud of them. The Conductor V2+ also uses tighter-wound transformers than before, tighter even than most brands. These custom high-density transformers supply twice the power of previous Conductor products. Also, while still a pure Class A designed with FETs (Field Effect Transistors), Conductor V2+ fully utilises the two 70W transformers to output over 8200mW per channel into 16ohm. Just over eight watts will comfortably drive the toughest headphone in the world. 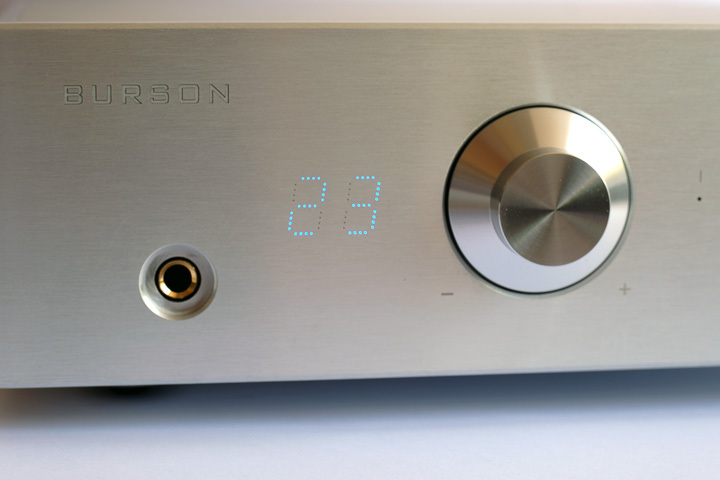 At the heart of our Burson’s new volume control is Burr-Brown’s flagship analogue PGA2310. It offers a set of impressive specifications, including 120dB dynamic range and 0.0004% THD @ 1khz. The PGA2310 possesses two main components; a set of resistor networks and an op-amp output stage. The resistor network allows for 0.5db steps of fine control with channel matching within 0.05%. Compare that to conventional motorised volume controls which can only match channels to 7-10%. Burson’s set the PGA2310’s op-amp output stage to unity gain, so it essentially acts as a purely resistive volume control. This arrangement avoids any potential coloration the op-amp output stage may inject into the audio signal.